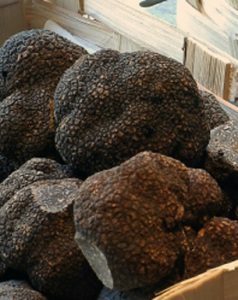 It’s that wonderful, pungent time of year when fresh truffles are available throughout France. The odorous—but delicious—fungi that grows underground near the roots of trees chiefly in woodland areas (and are traditionally found with the aid or trained pigs or dogs) is abundant during the late fall and early winter. And these rare—and very expensive—edibles, called the “diamonds of the kitchen” by French gourmands and considered a key element of haute cuisine (along with such pricey indulgences as Persian saffron, Beluga caviar and edible gold), are shaved, chopped and emulsified and served in dishes at many Parisian restaurants this time of year. They’re also available in shavings, slices and even occasionally whole at high-end markets throughout France. But one of the best places to stock up on the smelly delicacy—and one where you can buy truffle-flavored products at any time of the year—is Maison de la Truffe (House of Truffles), a small shop with an adjacent truffle-themed restaurant located directly on the Place de la Madeleine on the Right Bank. 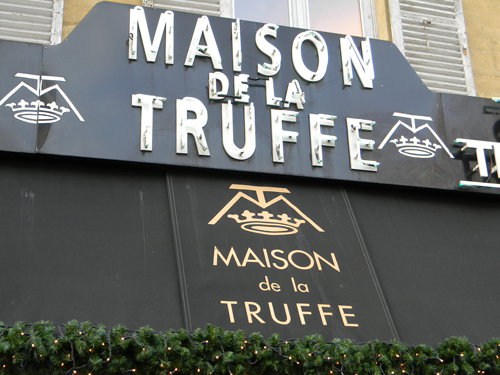 Founded in 1932, Maison de la Truffe was one of the first businesses in France to specialize in the sale of truffles and truffle-flavored foodstuffs, and as such it has developed long and fruitful relationships with truffle growers and harvesters throughout the nation, ensuring that the shop obtains the very best and freshest products. Decades of expertise also ensures that shoppers have access to the very best advice and information possible about the fungi, how it can be cooked and what varieties are best paired with particular dishes or wines. 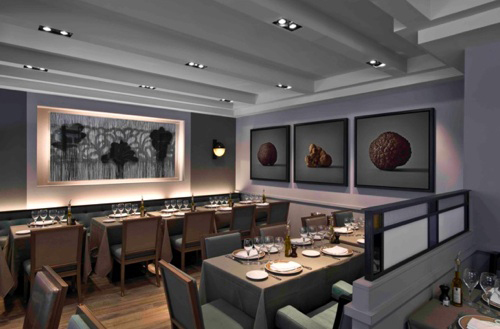 In 1972, chef Guy Monier purchased Maison de la Truffe and added the adjacent restaurant that serves truffle-flavored cuisine to both Parisians and tourists alike. 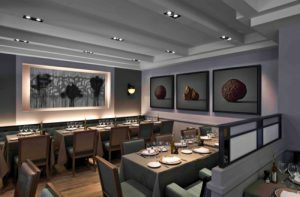 A second shop-restaurant was opened recently at 14 Rue Marbeuf in Paris’s 8th Arrondissement near the exclusive Avenue Montaigne and its enormously expensive designer boutiques and couture houses. 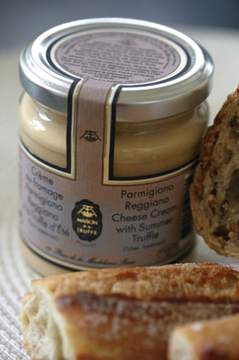 Instead, do what we always go and stock up on cheaper truffle-flavored products at Maison de la Truffe, like oils, salt or tinned foie gras (foie gras that is not pre-packaged is another customs no-no). A bottle of olive oil infused with black truffles is currently priced at about €20, gray salt with truffles at €18, truffle mustard for €9, truffle-flavored grated Parmigiano-Reggiano cheese at €17, goose foie gras with black truffles for €22, and even truffled chocolates available from €11 to €16. Or, if your goal is simply to try the fungus without breaking the bank—or stinking up your luggage—sample the dishes at the boutique’s adjacent restaurant. Some of the more affordable options include a starter of beef carpaccio with truffles and parmesan cheese for €23, an entree of shrimp and truffle risotto for €29, and a truffle-infused creme brulee dessert for €11. Expect a three-course, truffle-themed meal to cost anywhere from €70 to €100 (about $90 to $125), but you can certainly order just a main plate if you’re on a budget. The scrambled eggs with truffles is probably the most popular single-dish meal sold at the restaurant. Maison de la Truffe is located at 19 Place de la Madeleine and is just steps from the Madeleine Metro station. (The Rue Marbeuf location is accessible from the George V or Franklin D. Roosevelt Metro stops.) The shop is open 10 a.m.-10 p.m. Monday-Saturday (closed Sunday). 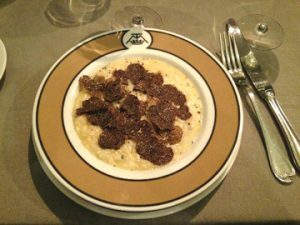 This entry was posted in Food, French culture, Restaurants, Right Bank, Shopping, Winter in Paris and tagged Maison de la Truffe, truffles by Bob Adams. Bookmark the permalink.